As we enter the late period of July, a few changes to the local fisheries always begin to creep into the consciousness of anglers. The “new season” isn’t that new anymore, and some of the fish that were being caught in the back bay and making their way to the ocean. With that comes new opportunities to find a keeper. Summer staples such as snapper blues are being caught in local lagoons and at the Mantoloking Bridge, and puffer fish are being caught at the bridge on squid and clam chum. Fluking has been excellent at both the Axel Carlson and Sea Girt reefs, Pete said, and numerous keepers have been boated from the Axel this week. Crabbing remains hot throughout northern and central Barnegat Bay. Fishing was plentiful in the suds near Seaside Heights, Seaside Park and Island Beach State Park, John from The Dock Outfitters in Seaside Heights said. “Fluke and small blues in the surf by day and sharks, rays and, yes, that elusive striped bass every now and then when you don’t expect it on the evening tides,” he said. Bucktail-Berkeley Gulp combos or stripped squid instead of the gulp, are your choice for the fluke. Cut or whole mullet along with fresh bunker chunks are enticing the blues. Thin metals are also worth a try for the blues, he said. Mario at Murphy’s Hook House in Toms River said the surf was quiet Thursday, but blues were being found in the bay behind Island Beach State Park. “Crabbing was very good again yesterday on both sides of the Toms River with plenty of keepers going home for the table,” he said. Snappers and blowfish are also around and are two fun species to fish for while crabbing, Mario said. 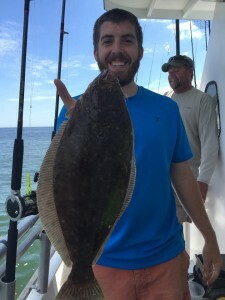 A good fluke bite was confirmed at Island Beach State Park by the folks at Grumpy’s Tackle in Seaside Park, but nighttime is apparently yielding some of the best results. “We are getting more reports of Sharks at night and even more reports of Rays so keep a good eye on your rods or even better, hold them!” Grump said. On the party boats, it’s a steady pick of fluke and sea bass. The crew of the Jamaica II out of Brielle had one slow fluke but made up for it in sea bass. Remember – sea bass closes at the end of the month until late October, so head out on a party boat to reel a few in before the season closes. As always, we welcome your tips, stories and catch photos to daniel@shorebeat.com. Tight lines, and see you next week!